Imagine your walking trail to school being littered with landmines. Education is restricted because you spend your life on the run between villages, living in jungles and refugee camps to avoid mortar shelling. Chronic food shortages reduce you to eating grass roots. Your school in a "new village" has been rebuilt for the fourth time because soldiers who want you dead burnt it down on the previous three occasions. All that shelters you and your family is a plastic sheet hung over a tree in the forest. You can never go back to your village because there is none to return to, and you are stateless, meaning that no country to know you. Then when you finally manage to seek asylum in a safe country, you live with the constant fear of being deported because you call for peace, freedom and democracy. For individuals fleeing for safety from Burma, this is a normal life. Zoya Phan, a young woman from Karen State, is lucky enough to relay her account where many others cannot, and her story speaks for thousands of people who have lived through similar horrors. 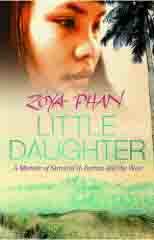 Named after a Russian resistance fighter, Zoya is the face for Burma Campaign in the United Kingdom. She and her family have foregone stability to prevent deportation to Burma, where the military regimes welcoming committee guarantees only bullets and pre-marked graves. She has seen hell engulf her previously unharmed village with her own eyes from childhood to teenage years, and has carried the message to act decisively throughout her adult life. This girl from the jungle born to resistance fighters has forced a re-think in British foreign policy towards Burma and the effectiveness of aid. Her sincere honesty has roused the average Briton and political elites, and is given the respect warranted for any conflict survivor. Zoya was born to fight. Her parents, committed resistance fighters, inspired her to be tough yet compassionate. Raised by a father who spent time away from home as part of his duties as President of the Karen National Union (KNU), Zoya relays the importance of seeking peace without compromise in her eloquent dialogue. Equally as influential is her mother, a battle hardened soldier, who tells of skinning pythons so that her platoon could eat and shows her resourcefulness by engaging in agricultural activities and animal rearing. The constant message here is Zoya is the value of sticking together as a family unit. Amidst the terror lies a humbling and wonderful picture of simple childhood; making mudpies on the floor of village school classrooms, the simplicity of receiving stationery goods, and treasured family moments that she wishes would never end, even in a time of war. We get to examine the close kinship developed with community members that rejoices and mourns together. Sometimes tragedy gives rise to a rare chance to educate the world about the horrors of war-related trauma. The fear of expulsion from Thailand and the United Kingdom stalks her at virtually every corner. Many of us cannot readily relate to this unless we have traced the same steps. But sometimes, life hands us a slice of good fortune to grasp and there is a chance to make a difference. Zoyas moment appears at a rally on Daw Aung San Suu Kyis 60th birthday in London. Dressed in traditional attire, her brief but powerful speech put the spotlight back on events in her homeland again and makes BBC headlines. His back was shattered, as he had been forced to work as a porter, carrying heavy loads to build barricades for the military junta...once the man could lift or move no more, after numerous beatings, he was thrown into the river...."
One aspect that the Karen and all ethnic minorities in Burma never lose is the tendency to laugh as a means of coping with hardship. It is impossible not to smile at this lady whose first experience with putting on lipstick differs wildly from using vitamin pills, encountering escalators for the first time or struggling with other modern conveniences such as an electric plug. While Little Daughter is an obvious collectors item for all people with an interest in the tragic events affecting ordinary civilians in Burma, readers will find themselves drawn to a woman who speaks from the heart and shows maturity beyond her years. Like Kim Phúc, the Vietnam Wars most famous anti-war icon, has been saying for many years. We all yearn for the right to live in a peaceful homeland. Zoya Phan, the woman from the jungle is one brave warrior and an excellent advocate to call for an end the genocide in Burma.